The annual festival continues through Sunday with events including a lobster crate race, fish head relay, build-a-boat contest and pirate encampment. 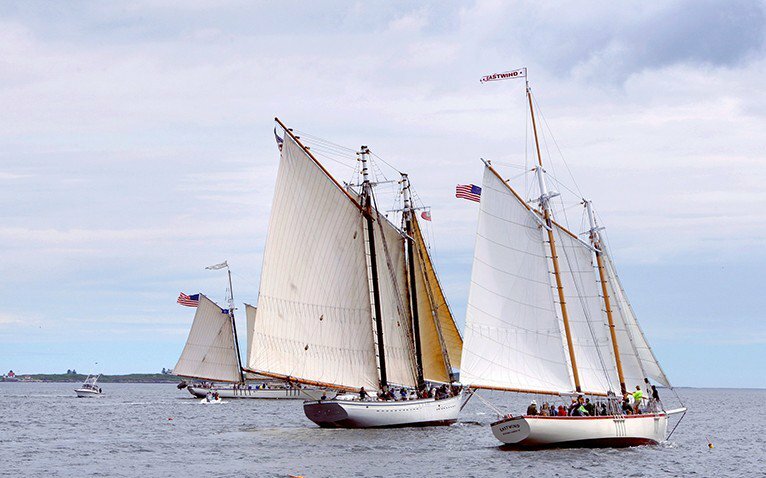 CAMDEN – Maine’s historic fleet of windjammers is on display at the annual Camden Windjammer Festival. The festival kicks off Friday with the arrival of more than a dozen windjammers and an evening capped by fireworks on the waterfront. The event continues through Sunday with events including a lobster crate race, fish head relay, build-a-boat contest and pirate encampment. Organizers say the event celebrates Camden’s maritime heritage, including clipper ships and coastal schooners built in the harbor. Part of that history includes Frank Swift and his Maine Windjammer Cruises that started in the 1930s. His efforts to trade cargo for passengers saved vessels from destruction as the golden age of sail gave way to powered ships.